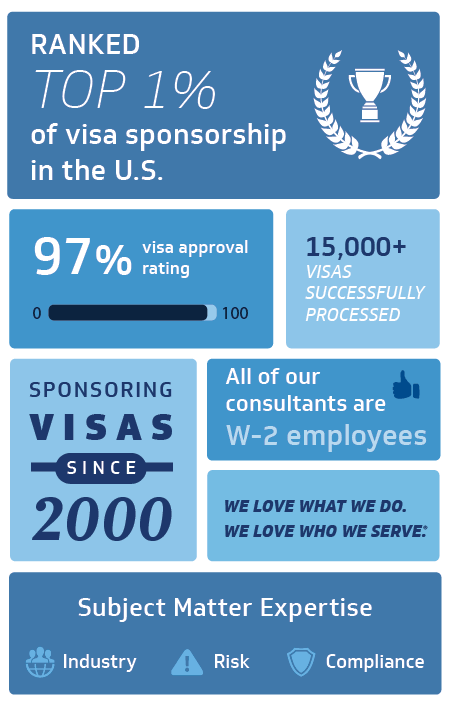 As a Visa Sponsor ranked in the Top 1% in the U.S., we work with foreign-born consultants through the Kforce visa sponsorship program and provide tailored solutions to consultants facing immigration challenges. As the global workforce rapidly evolves, it is critical now more than ever that international consultants choose the right partner for their visa sponsorship and employment needs. Our subject matter expertise and strict adherence to the United States Citizenship and Immigrations Services (USCIS) regulations enables us to secure visa sponsorship for multiple visa types, including H-1B, TN-1, E3 and TN-2. Our e-verify certification offers students in STEM majors the potential to extend their OPT visa for 24 months. We recognize the uniqueness of each visa situation and address and resolve any issues to ensure a successful engagement. Kforce directly markets candidates to end clients, alleviating third-party channel issues, such as visa denials, payroll discrepancies and travel prohibitions. Our process is supportive of your pursuit of your green card. We allow filing under EB-2 as long as requirements are met. Before your current assignment ends, our redeployment team of experienced staffing specialists are finding your next opportunity. As a publicly traded U.S. company, Kforce’s client portfolio highlights partnerships with over 4,000 customers, including 70 percent of the Fortune 100. Delivering applications and systems software architecture, development, testing and maintenance. Supporting all technical data platforms from unstructured to mature Big Data environments. Offering a full suite of functional professionals to support technology and business initiatives with program and project management, business analysis, quality and documentation. Providing engineering professionals to support product development to include design, quality, process engineering, operations and supply chain management. Specializing in providing full service cloud bases solutions for enterprise level environments across a variety of platforms.